Jack Whyte was born and raised in Scotland, and educated in England and France. He migrated to Canada from the UK, in 1967, as a teacher of High School English, but he only taught for a year before starting to work as a professional singer, musician, actor and entertainer–a career he followed, one way and another and with many variations, for the next twenty-odd years. 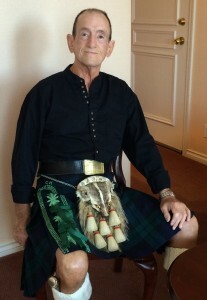 He has taken great pride in being the Regimental Bard of the Calgary Highlanders for more than thirty years. In the early 1970s, Whyte researched, wrote, directed and appeared in a one man show based on the life and times of Robert Burns, Scotland’s national poet. He toured Canada with the presentation, which he had written to appeal to non-Scots, Canadian audiences, de-mystifying the poet and his works–the man wrote and spoke in a dialect called the Doric, which has fallen into disuse over the past two hundred years and is now largely unintelligible even to modern Scots–and his primary aim was to make the works understandable and enjoyable to North Americans. The success of the show led him into writing for CBC National television, and eventually to a career in advertising, where he refined his craft and his writing skills as Head Writer and Creative Director of several advertising agencies before moving to the other side of the client-agency relationship, to act as Corporate Communications Director for a number of public and private companies. Whyte’s interest in 5th Century history and the 460-year Roman military occupation of Britain springs from his early Classical education in Scotland during the 1950s, and that interest, allied with an equally fervent preoccupation with the Arthurian legend, led him, in 1978, to a sudden realization of the probable truth underlying the legend’s central mystery of the Sword in the Stone. Then, knowing how it had been done, Whyte set out to tell the story, and to establish King Arthur securely in a realistic and feasible historical context. His saga, fleshed out by years of research, continues to delight his large and growing audience, now that he has branched out into other times and other topics, so much so that, in September of 2009, Penguin Group Canada announced publicly that aggregate sales of his books, in Canada alone and independently of International sales, had passed the 1,000,000 mark in a country where 5,000 sales qualifies a book for Bestseller status. Whyte is married, with five adult children, and lives in British Columbia, Canada. The emphasis in the past few years has been on Whyte’s new “Guardians of Scotland” trilogy, in which he set out originally to explore the lives and achievements of Scotland’s three greatest, legendary 14th-Century heroes: William Wallace, known today as the Braveheart, though that name was never applied to him while he lived; Robert the Bruce, King of Scots who was, in fact, The Brave Heart to his contemporaries; and Sir James (the Black) Douglas, who died protecting the King’s embalmed heart, which he had taken on Crusade to Spain at the King’s own request, after the Bruce’s death. In recognition of Douglas’s heroic death, he was posthumously honoured by the addition of a Crowned Heart to his family coat-of-arms, thereby becoming the third man entitled to be known as a Brave Heart. As is true with many of life’s best-laid schemes, though, Life itself was to alter Whyte’s plans for the Guardians Trilogy through the simple process of change. The success of the 1995 film “Braveheart” was instrumental in triggering a new wave of high-tech, 21st Century research into everything known about Wallace and the Scots Wars of Independence, and evidence soon emerged to indicate that there was another, fourth and hitherto unsung hero in the Annals of that time, a man called Andrew Murray, who co-commanded the Scots army with Wallace at the Battle of Stirling Bridge. Murray had been fatally wounded during that engagement, but new research has indicated very strongly that had Murray survived the battle, he might well have gone on to eclipse Wallace in the history of the Wars. His story was known, but his historical role in things had been greatly underplayed due to his untimely death. History requires a winner, and the surviving winner at StirlingBridge was William Wallace. And so Whyte found himself compelled to write the previously unsung tale of Andrew Murray, who might—who can tell?—have been the noblest hero of them all. And that, of course, resulted in a completed trilogy that lacked a closing volume, the story of Sir James Douglas which has been promised but not yet written. Stay tuned. Whyte’s most recent project prior to the Guardians Trilogy was The Knights Templar trilogy, three novels dealing with the rise and fall of the Order of the Knights of the Temple of Solomon. All three of those novels, Knights of the Black and White, Standard of Honor and Order In Chaos were published throughout the English-speaking world, by various Publishers in Canada, the US, the UK and the British Commonwealth, and have been translated into all the major European languages and a number of lesser, more regional ones. This trilogy—three stories separated from one another other by approximately eighty-five years in each case—marked a new departure for Jack Whyte, whose nine earliest books comprise a cycle of sequential novels examining the historical beginnings of the Arthurian legend and offering a non-mystical and feasible explanation of how the original root elements of the legend might originally have come into being. The original Canadian edition of the first novel, “The Skystone”, from Viking Press, 1992. The first novel in Whyte’s original series A Dream of Eagles, (known in the United States as The Camulod Chronicles), was The Skystone, and it was published in Canada, in 1992, by Viking Press, a division of Penguin Group, Canada, Inc., now known as the Penguin/Random House Group. And since that time, the series has been published and widely distributed internationally. The Singing Sword appeared in Canada in 1993, followed by The Eagles’ Brood in 1994, The Saxon Shore in 1995, and The Sorcerer (which was published in two 500-page halves) in 1997. All were critically acclaimed and achieved Canadian Best-Seller status on the Toronto Globe & Mail’s Top Ten Best Seller list. In 1995, Whyte sold the US Rights to the series to Tom Doherty Books, a subsidiary of St. Martin’s Press of New York, and the Marketing Division there (Forge in hardcover and Tor in paperback) decided to change the title of the series from “A Dream of Eagles” to “The Camulod Chronicles.” The first American edition of The Skystone appeared in hardcover in the USA on February 1, 1996, and won a “starred” review in the January 19th issue of the high-profile Publishers Weekly. The Eagle, the last of the nine-book cycle, was published in hardcover in the United States in February, 2007. Whyte’s Arthurian books quickly became national favorites in Italy, too, where they were published in five separate and successful editions by Piemme, one of the largest Italian publishing houses. So successful was his penetration of the Italian book market that all of his books, including the latest “Guardians” trilogy, are strong sellers and his name has achieved brand recognition in the country. With the concluding scenes of the fifth novel in the original series, The Sorcerer: Metamorphosis, the original story, as Whyte had initially conceived it, supposedly came to an end. The Dream of the original Eagles, Caius Britannicus and Publius Varrus, had become a reality with the crowning of the young King whose beliefs and example would shape the future destiny of the people of the island of Britain, and a legend had been born. But of course, the story—the legend—of King Arthur was just beginning at that point. Whyte, originally, had no great interest in retelling that story, since it had been told so many times before, but as his own tale progressed through successive generations, a new reality came into being… An entire generation of readers who demanded to know the full resolution of the classic story, as seen through the eyes of the characters who had enacted the Dream of Eagles. In consequence, and in acknowledgment of the demands of his readers, Whyte penned Uther, a separate, companion novel to the series, explaining and resolving several of the mysteries that had been left unsolved at the conclusion of the third book, The Eagles’ Brood. He then continued, and concluded, the story of Arthur’s reign in a two-book “miniseries” sequel called The Golden Eagle, narrated by Arthur’s closest friend, Clothar the Frank, whom the world would come to know centuries later as Lancelot. 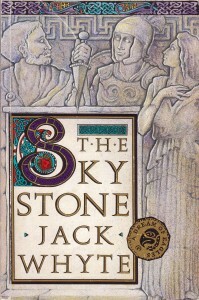 Today, for publication in late 2016, he is working in response to requests and queries from readers who have been asking him for the past 23 year to revisit his original novel, The Skystone, and tell the story of the protagonist’s grandfather, Gaius Quintus Varrus, the swordmaker and collector of antiquarian weaponry who found the first, original skystone and smelted the metal from it to make a unique and magnificent, stainless steel dagger that he called the Skystone blade.